“I didn’t know you liked fairy tales.” I address Thalia’s cat, Johannes, who sits on the study table, my copy of Jack Zipes’s translation of Grimm lying open in front of him. “I never said I didn’t,” he answers coldly, inserting a deft claw between the pages, turning a leaf, and pinning the opposite page with his other claw. This explains why my books are not always where I leave them. They often end up on the floor. Looking over his head, I see he is reading The Nixie in the Pond. 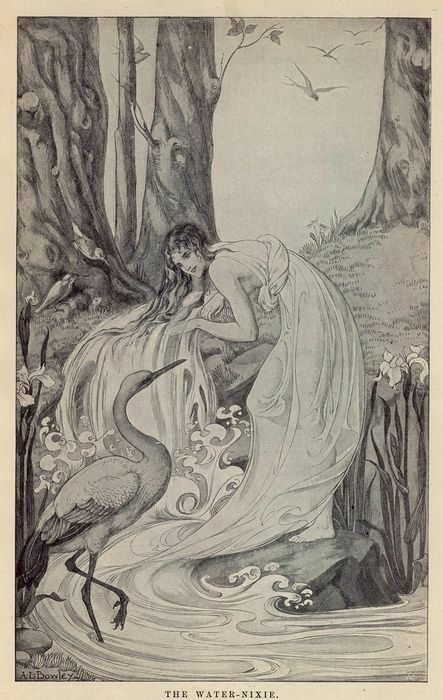 In this tale a miller is approached by a nixie—a mermaid-like creature. He bargains for wealth in exchange for what is being born at that moment in the mill. He thinks it to be a dog or a cat, unaware that his wife is birthing a boy in the mill as they speak. 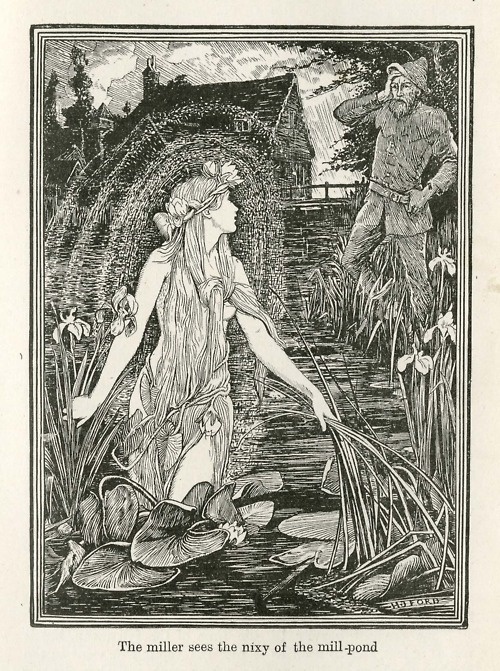 The miller cheats the nixie by keeping the lad away from the pond. The youth grows up, becomes a huntsman, and marries. One day, while hunting, he washes blood from his hands at the mill pond and is seized by the nixie. His wife, discovering his plight, circles the mill pond, calling his name until she collapses and is taken by a dream. In the dream she climbs a mountain until she reaches a hut at the door of which an old woman beckons to her. Upon waking, the young woman indeed climbs the mountain and meets the old woman who beckoned to her in the dream. The old woman gives the younger a golden comb with the instructions to comb her hair, in the moonlight, by the mill pond, then set the comb down by the water’s edge. When she does these things, the water rises up and takes the comb in exchange for a glimpse of her husband’s face. Again, the woman dreams of climbing the mountain and, again, she actually does. The old woman gives her a golden flute to play by the mill pond. In exchange, the wife sees more of her husband. Again the dream and the visit; this time the young woman returns with a golden spinning wheel. For it, the husband is fully revealed and escapes from the nixie. Together they flee, with the water rising quickly behind them. 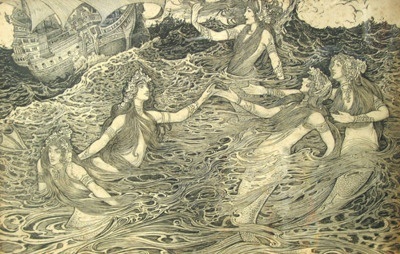 Fearful of drowning, the younger woman cries out to the older. She is transformed into a toad, and he into a frog. In these forms they survive the flood, but are separated. Returning to their human shape, each finds themself in a foreign land. Lost and no longer together, they each become shepherds in order to make a living. For many years they drive their flocks from pasture to pasture, gradually moving closer together. When they again meet they do not recognize each other, but take comfort in each other’s company. One evening the man plays a tune on his flute, the same that she played at the edge of the mill pond. She cries and tells her story. The veil falls from their eyes and they are reunited. And, ah yes, they live happily ever after. “What do you think?” I ask Johannes. “As well it might,” I say. Johannes curls up and goes to sleep. While contemplating The Nixie in the Pond, I decide to go to the authority on the topic. I do this despite the cold weather and the lateness of the day. In addition, it always feels a bit warmer in winter and cooler in summer in the magic forest than elsewhere. I grab a paper bag of unshelled peanuts and head out. My destination is fairly deep into the forest, but I know it is safe, even under the moonlight, as long as I stay on the path. At the path’s end is the pond. It’s never frozen over. I am sure that has something to do with her. I sit on my rock at the top of the bank to wait. Immediately she appears, posing on her rock at the pond’s edge, water flowing from her hair and arms as though she were a trickling fountain. “Hello, my nixie.” We have never exchanged names. I doubt it is safe to do so. I shell a peanut and toss it to her. She catches it in her thin, pale-green hand and pops it into her mouth, rolling her eyes in ecstasy. I can see that anger in her eyes and I throw more peanuts to placate her. “They were husband and wife,” I reason. “That is of no concern to me.” She is looking at a peanut kernel between her fingers. As I shell more peanuts, I am thinking there is a bigger question, but I cannot wrap my mind around it. I am stunned by the offering. She sees into my soul. I am as transparent as glass. The enormity of this opportunity seizes me. “I am interested. You are right, I am full of questions. Your offering of answers trembles my heart. You will do this for me in exchange for …? No, I am not going to ask!” Images of Thalia flicker in my mind. “Here.” I toss my nixie the bag of peanuts and make an escape. Back in my study, after checking in on Thalia sleeping peacefully, I light a fire in the hearth to soothe my shivering. Or am I trembling after my encounter with the nixie? I should know better than to underestimate anything fay, be it a tale or the real thing. I settle into my comfy chair and let my thoughts wander back to The Nixie in the Pond. If Augustus were here, I think he’d agree that one of the striking features of this tale is the wife’s dreams. There is something shamanistic about the wife dreaming three times and actualizing the dreams by climbing the mountain to see the old woman who beckoned to her. At this point in the story there are three realms: the nixie’s world under the water, the wife’s world on land, and the old woman’s world atop a mountain accessed by dreams. When the husband escapes from the nixie, he and his wife are reunited briefly, but their world shifts; they are transformed into separate creatures—a frog and a toad—and swept away, each taken to a different land unknown to them. Now there are two realms, both alien. Unaccountably, they become (transform into) shepherds, and slowly, unconsciously, drift back toward each other until they once again occupy the same realm. Yet, they do not recognize one another. It is not until they know each other’s story that their reunion takes place both physically and spiritually. It is tempting to put this tale into Freudian terms. The three realms could be the Id (nixie), ego (wife), and superego (old woman). The two realms could stand for the disintegration of the personality (bi-polar, schizophrenia), and the one realm to represent the reintegration, the healing, of the personality. Many fairy tales fit neatly into the Freudian mold as Bruno Bettelheim famously noted. With the fire tongs I work the unburnt ends of logs in toward the glowing embers. I could view the tale in Campbellian terms (I looked that word up; it really does exist. ), which is the “hero’s journey.” When the miller bargains with the nixie, I see that as the “call to adventure.” When the huntsman washes the blood from his hands and is snatched by the nixie, he enters the “belly of the whale.” The old woman whom the wife encounters is the “supernatural aid.” Escaping from the nixie only bring them more hardship, casting them upon the “road of trial.” At the end of the tale the husband and wife are reunited, which is of course the “ultimate boon. I could invent another scenario about how the story reflects on the trials of a mundane world’s marriage, but I need to stop somewhere. The tension that pervades this tale is that of the tentativeness of our existence, an element which underlies most good fairy tales. I sympathize with both the husband’s and the wife’s travail. It’s the story’s pattern that leaves me with a sense of satisfaction. Events come full circle. And of course, there is a happy ending. I notice my shivering has stopped and I drift off to sleep lounging before the fireplace.